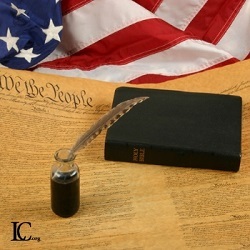 WASHINGTON, Jan. 16, 2019 /Christian Newswire/ -- President Donald Trump recognizes that faith is embedded in the history, spirit, and soul of America and today issued a Presidential Proclamation affirming Religious Freedom Day, 2019. In recognition of this day, President Trump states in his proclamation: "On Religious Freedom Day, we celebrate our Nation's long-standing commitment to freedom of conscience and the freedom to profess one's own faith. The right to religious freedom is innate to the dignity of every human person and is foundational to the pursuit of truth." Religious Freedom Day is celebrated in America each year on January 16 to commemorate the anniversary of the passing of the 1786 passage of Thomas Jefferson's Virginia Statute of Religious Freedom that ended the state-established church in Virginia, finally protecting religious rights for all people. The Anglicans had fined, persecuted, jailed and murdered Christians who were not part of the state-established church. However, Jefferson, a lifelong fervent advocate for the rights of religious liberty and religious conscience, worked hard to protect and defend those Christians. President Trump also stated: "Our Nation was founded on the premise that a just government abides by the 'Laws of Nature and of Nature's God.' As the Founders recognized, the Constitution protects religious freedom to secure the rights endowed to man by his very nature. On this day, we recognize this history and affirm our commitment to the preservation of religious freedom." To further promote religious freedom, President Trump nominated, and the Senate confirmed, Gov. Sam Brownback of Kansas to be Ambassador-at-Large for International Religious Freedom, Department of State. In the ambassadorship, Brownback leads the Office of International Religious Freedom, which is under the umbrella of the State Department and charged with promoting religious freedom as a foreign policy objective. U.S. Secretary of State Michael R. Pompeo and Vice President Mike Pence also hosted the first Ministerial to Advance Religious Freedom last year at the U.S. Department of State to discuss ways to combat religious persecution and discrimination and to protect religious freedom around the world. This was a historic first for any country in the world, and representatives of international organizations from over 80 countries attended. "I commend President Trump for commemorating today as the 233nd anniversary of the passing of Thomas Jefferson's Virginia Statute of Religious Freedom, which has shaped and secured our cherished legacy of religious liberty," said Mat Staver, Founder and Chairman of Liberty Counsel. "We must continue to embrace and protect our religious freedom in America and around the world. Christians and religious minorities are now suffering more persecution than at any time in history," said Staver.